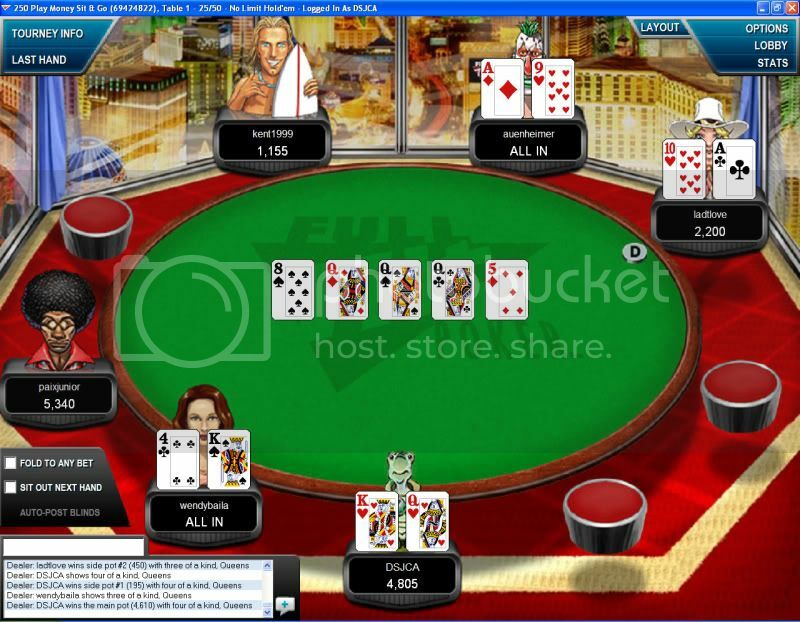 Flopped a royal flush while playing fake Texas Hold 'Em on XBox 360 the other day. Had 10D QD, flop was JD AD KD. The first royal flush I've ever gotten, and maybe the last: The odds of a getting a royal flush are around 650,000:1 according to a quick Google search. The odds of flopping one are even more astronomical than that, I'm sure. 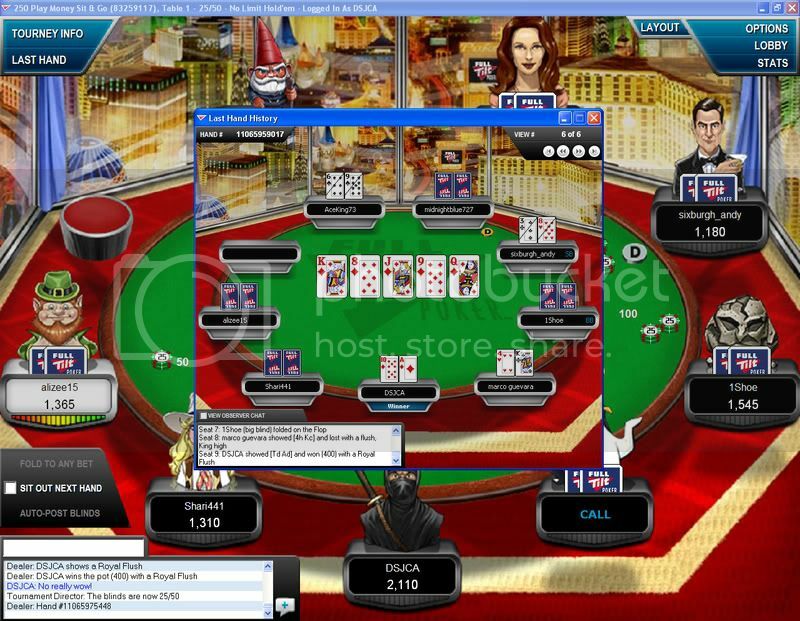 Just played a quick game online, the K-4 is the 1st all in then A-9 goes all in then 10-A goes all in. Now with me having K-Q suited & short stacked, I figure that's not shabby & go all in. Hell. it's only play $$$. In the end I was 2nd. I know the following doesn't make a lot of sense but it describes my play. I am a somewhat tight player that likes to see a lot of flops. Someone made a straight on the river on the first hand and that cost me a third of my stack (I had trips). On the third hand I had pocket Queens. I was one of the last players to act in this hand. By the time it got to me the bet was already up to half my chips. I decided to go all in. Very much not my style. LOL, I got five callers! 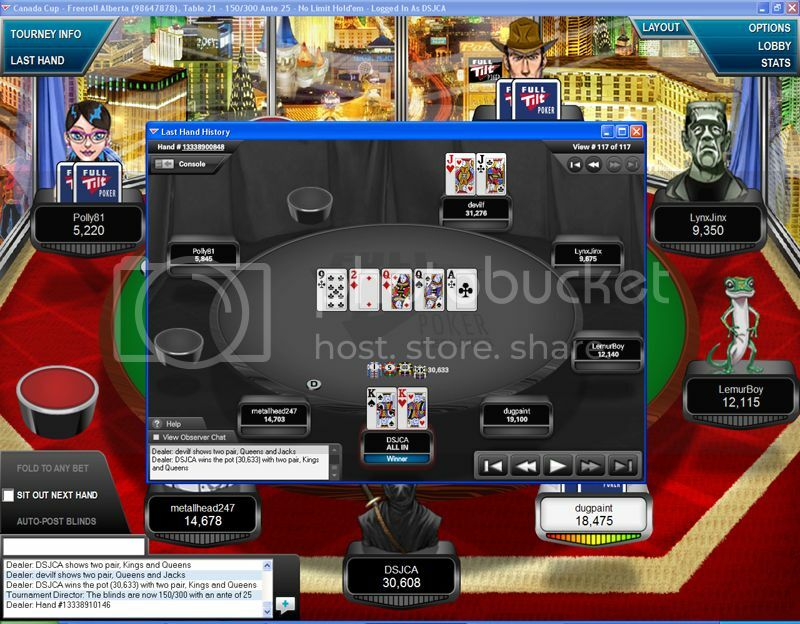 Another player had pocket Aces and took the pot. Nothing like quintupling your stack by the third hand of a tourny. Not the craziest story but I thought I would share. We are down to around 3 or 4 tables. I have around 5K in chips which is slightly higher than the average. I had 7/5 off suit and flopped the nut straight. I bet and I am re-raised. I go all in and I am called. The caller has 5/2 off suit giving him a smaller straight. BTW, it was a rainbow flop. He happened to have one heart. 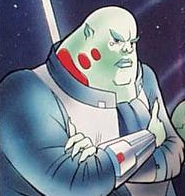 The next two cards? You guessed it. Running hearts giving him a flush. This is the best I have placed in this tournament, I play this 100k challage 3 or 4 times daily. There are currently two separate dates for two separate “Holiday 100k” tournaments that will be played. The dates are December 27th & December 28th, they added a second day because of the demand. The Freerolls start at 40 minutes past every hour & only the top 3 get an entry (2000 FTP's). It was coming up to the 2nd break when I got KK, all in! ******* pocket AA's! 39th place, so close but yet do far. Pretty damn good out of 3600 tho. I think I'm in love with Mrs. Doughty. Congrats on the nice finish. Playing at FTP just now. I had Kh Jc, guy goes all-in pre-flop for 1000 chips so I fold. Flop is Ac 10c Kc. Turn is Ad. Here comes the river, and wouldn't you know it, it's Qc. Yep, I would have had another royal flush had I called. Now what are the odds of getting a Royal Flush with all the cards! 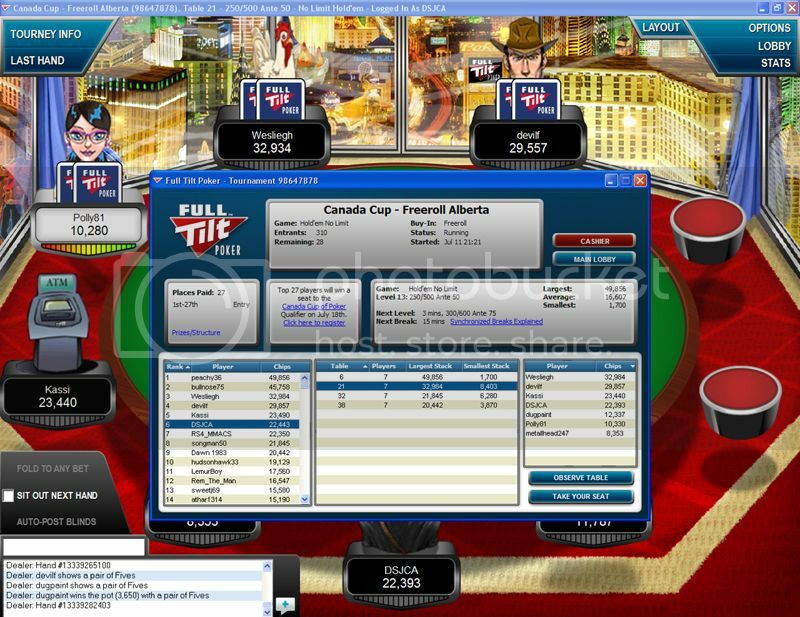 For the past few weekends, I have been trying to qualify for the Canada Cup of Poker on Full Tilt. Only 310 players as I did my late registration tonight for the province of Alberta. Only the top 27 qualifiers win. Represent your Province in the Canada Cup of Poker. Seven teams from different regions of Canada will battle it out on TV for a share of CAD145K. 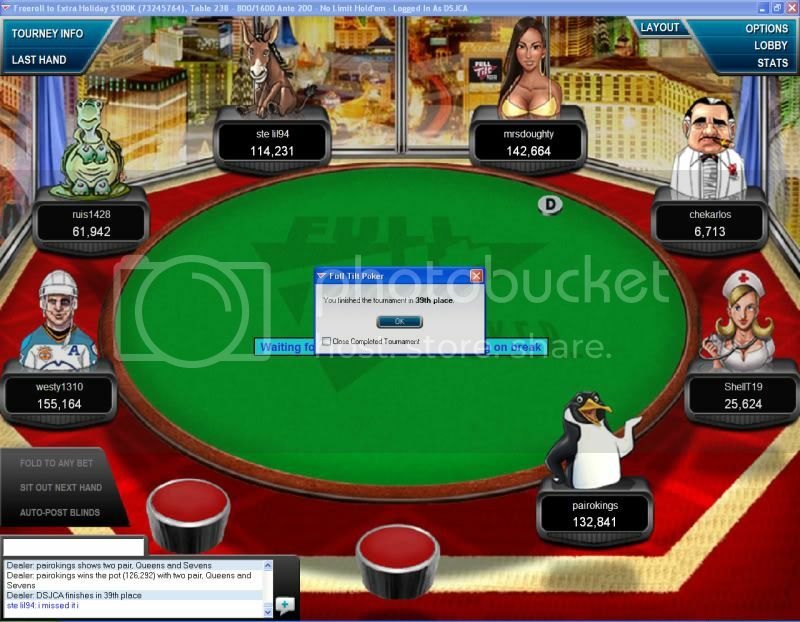 The winning team will play against the Full Tilt Poker.net pros for a chance to win up to CAD250K. The Canada Cup of Poker is a new kind of tournament where teams play relay-style with a community stack, rotating “on the button”. You play as an individual, but win or lose as a team. Seven teams of three will fly to Toronto this August to compete in the televised final table. All teams will take home prize money, with the winning team splitting CAD75K. All three members of the winning Canada Cup team will go on to play heads-up against Full Tilt Pros for up to CAD250K. Promotion Dates: Friday, June 12th, 2009 to Sunday, August 2nd, 2009. 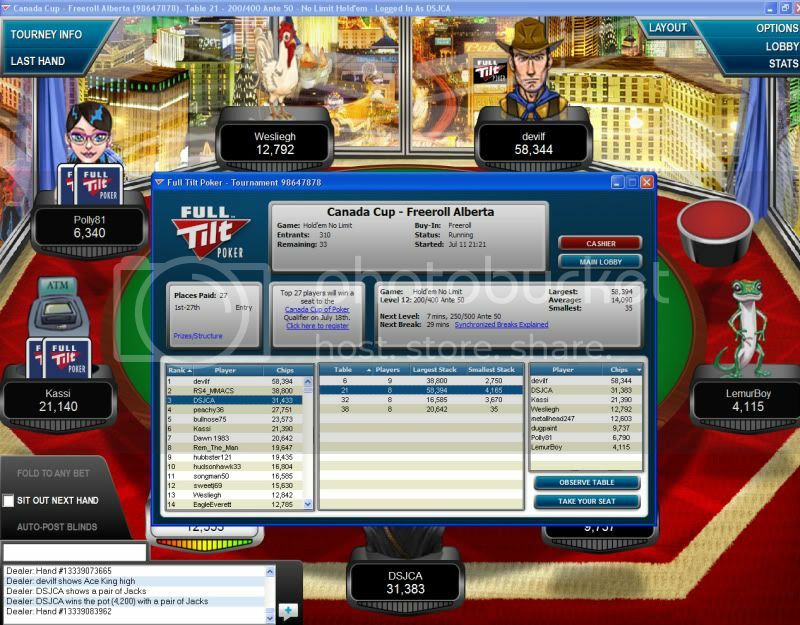 Each day between Friday, June 12th and Sunday, August 2nd of 2009, Full Tilt Poker.net will hold Canada Cup of Poker Freerolls where players can win entry to the televised Canada Cup of Poker tournament. 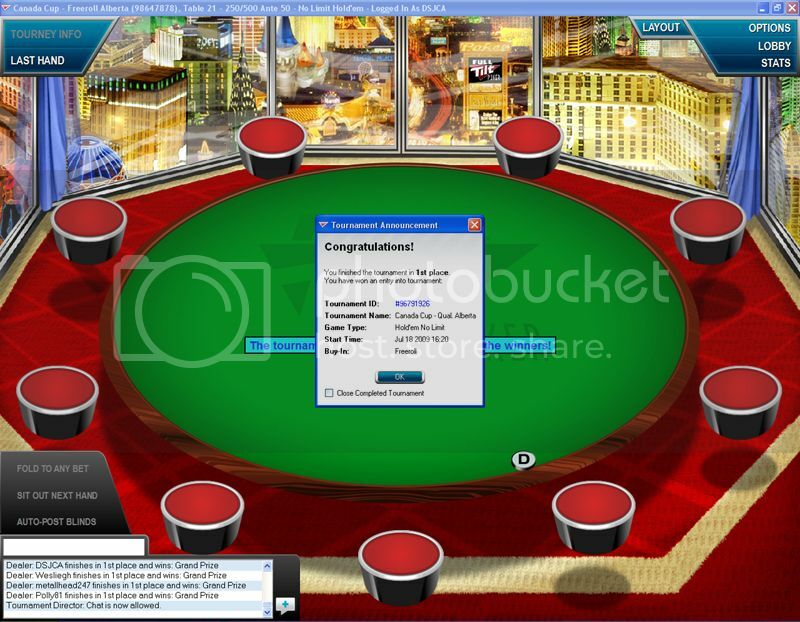 Each Round One Freeroll will award the top 27 finishers a seat to a Canada Cup of Poker Final. Each Canada Cup of Poker Final will award the winning player a Canada Cup of Poker prize package. To keep your chances of qualifying fair to everyone, we have broken the country down into seven regions instead of 13 Provinces & Territories. This will ensure that everyone has equal opportunity to qualify for their respective team. Winners will fly to Toronto this August to play on TV at the Canada Cup of Poker. All teams will take home prize money. The winning team is guaranteed CAD75K to share. All three members of the winning team will then play heads-up against Full Tilt Pros on TV, for the chance to win up to CAD250K in additional prize money. So with my late registration, I have to wait till I am the big blind to play. It's starts off OK & I win a few hands & I'm sitting around 70th-80th position. After a couple of breaks in the game, it goes crazy, the bets & raises get larger. I win a nice hand & it keeps me in 2nd place with all the players at the tables. Then I drop to 3rd with another win. I loose a hand to Polly81 & that drops me down to 6th place with 28 players left. 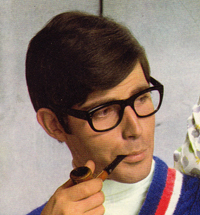 I keep watching the tourney chart for a player to be eliminated. So next Saturday night, I play against a bunch of other Albertan's from all over the province for a chance to go to Toronto. I'm not holding my breath for next Saturday night but wish me luck. Great job Dale! Good luck next weekend!